Many photographers hate the flash because they haven't learned how to tame it. But you can employ your strobe to create interesting, and yes even natural looking images... if you know just a few secrets. Modifiers that redistribute the light have some value, such as the Gary Fong Lightsphere. But there's much you can do with just your flash and good technique. In this podcast I review some of my favorite flash tips to help you get more natural looking pictures. I also mention the February 2007 photo assignment, "Texture." Deadline for submission is Feb. 28. You can read the details on our Submissions page. Now that I've piqued your curiosity, it's time to listen to today's audio show titled, "More Flash Techniques." You can download the podcast here (29 minutes). Thank you for the podcast "More Flash Techniques". 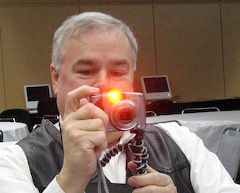 Through your podcasts, I learn ways to branch out into new aspects of digital photography. I have a question about white balance when using flash for part of the illumination in a scene where existing light also plays an important role. What is the best way to color balance in these settings? Is there a good way to use the Expodisc in these settings?